Control how the question list appears in your published quiz. Let's explore the question list options. 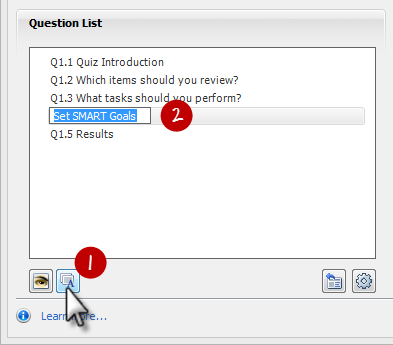 For the question list to show up in your quiz, you need to enable it in the player. Learn more about that here. 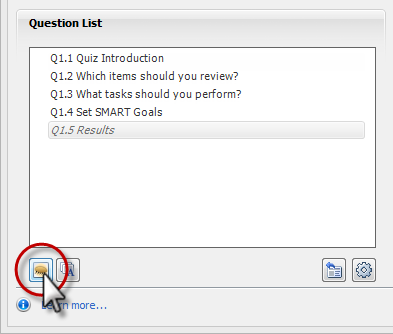 To customize your question list, go to the Home tab on the Quizmaker ribbon, and click Player. When the Player Properties window appears, click the Question List button on the ribbon. As you make changes to the options on the left side of the window, keep an eye on the Preview area on the right side of the window. It'll update to reflect your choices. The items you see in the player question list default to the slide titles you see in Question List View and Normal View. 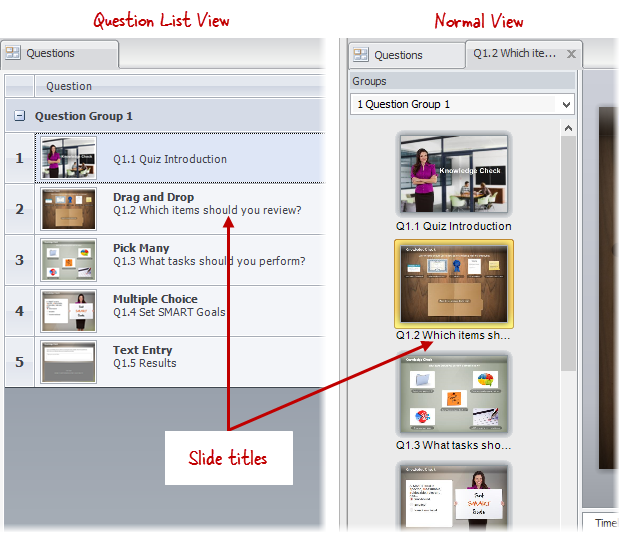 Select the slide title you want to edit, and click the Rename question button below the question list. Type the new name, and press Enter on your keyboard. Want to remove a slide from the question list? 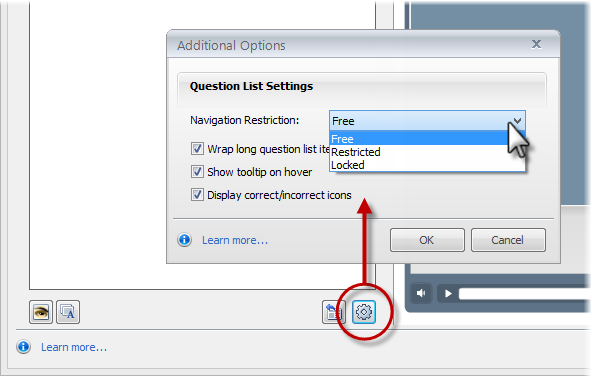 Select it, and click the Remove from question list button (the eye icon) in the lower left corner of the window. It'll become italicized to indicate that it's hidden from the question list. It'll still be part of your quiz. It's title just won't appear in the question list when you publish. To bring back a slide you previously hid, select it and click the eye icon again. If you change your mind about the edits you've made, click the Reset question titles button to return to the original state of the question list. 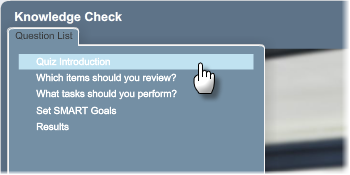 Click the gear icon (the Additional Options button) below the question list. 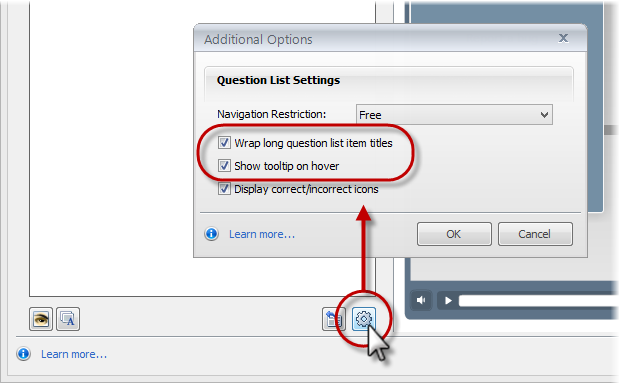 When the Additional Options window opens, mark the box next to Wrap long question list item titles if you want the text to wrap. Mark the box next to Show tooltip on hover to cause a tooltip to appear when learners hover over long titles. 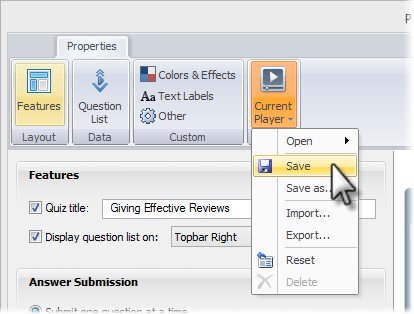 Free: This lets learners click titles in the question list to navigate to any part of the quiz at any time. They can view slides in any order. Restricted: This means learners can view the current slide and any slide they previously viewed, but they can't use the question list to jump ahead or skip over slides. Locked: This means learners can only view slides in the order you've designed. They can't use the question list to jump ahead or skip over slides, nor can they use it to go back to any previously viewed slides. When the Additional Options window appears, mark the box to Display correct/incorrect icons. Want to change the wording used for the question list drop-down on your player? The name comes from your player's Text Labels. If you need help editing text labels, see this tutorial. If you click OK on the Player Properties window and save your quiz, Quizmaker saves your player customizations in the quiz file. It's a good practice, though, to save your player separately, so you can apply the same player customizations to other quizzes.